S I G N & D I G I T A L G R A P H I C S • May 2018 • 43 where the consumer has more time to view it. Some customers will insist that additional information be included. In this case, be sure it's smaller, not as visu- ally bold and placed so it doesn't detract from the primary information. 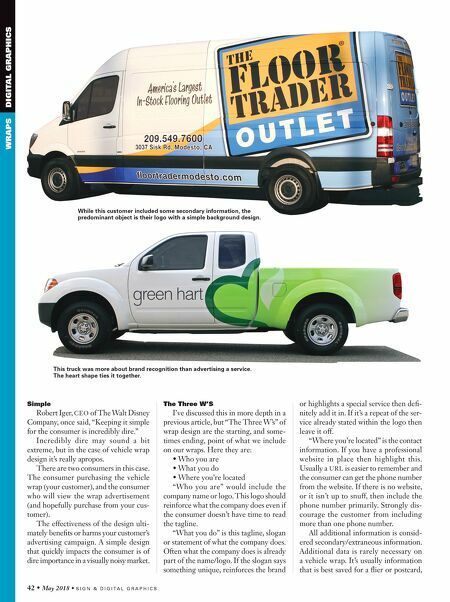 Background Part of a vehicle wrap design is adding in color behind the logo and text that sets it off from the color of the vehicle. The background color should contrast with the primary (three Ws) information and should not add unnecessary visual noise. Look for a simple, clean design that flows with the shape of the vehicle and won't distort over obstacles. Often sim- ple blocks of color or color with a subtle fade adds interest without distracting from the text. Pay attention to how the background design flows around the sides of the vehicle. Stripes should be designed to continue evenly around the vehicle or should end in lights or with a defined edge so it doesn't look off when viewed from an angle. If you have artwork down the sides that includes a pattern be sure to keep in mind how it will look across the hood or other horizontal plane as well. We'll often fade the edges to a solid color and then continue that fade into the same solid color along the other plane so it has a cleaner edge. If we have a fade, from one color to another color on the sides, then we match the same fade on the back. This means that during the design process you have to pay attention to where the fade transitions on the vehicle and keep it consistent. When designing a vehicle wrap you're often viewing one side at a time. Keeping your template or photos scaled and noting placement will keep the fade consistent during installation. Edges When the design is for a partial wrap, be sure that you design some interest into how the wrap ends and the background begins. 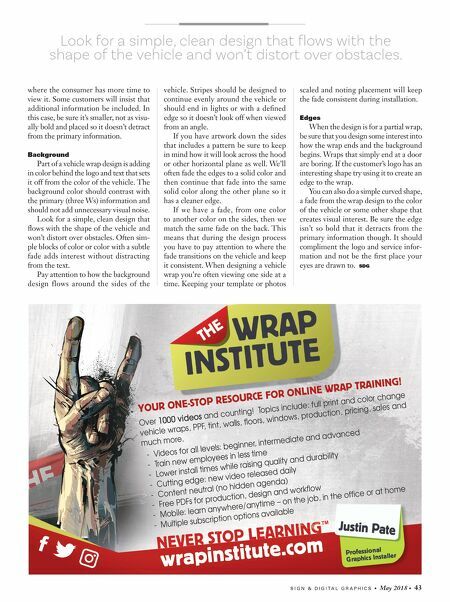 Wraps that simply end at a door are boring. If the customer's logo has an interesting shape try using it to create an edge to the wrap. You can also do a simple curved shape, a fade from the wrap design to the color of the vehicle or some other shape that creates visual interest. Be sure the edge isn't so bold that it detracts from the primary information though. It should compliment the logo and service infor- mation and not be the first place your eyes are drawn to. SDG Look for a simple, clean design that flows with the shape of the vehicle and won't distort over obstacles.